Browse: Home / Headless / Make Your Own Headless Guitar Tuners! …the brass was hacksawn and filed, drilled and tapped with just the simplest of tools. It works well and rarely needs any tuning, just climate change. There is even some surface rust but it went back together smooth. Simple and elegant. What more can I say? 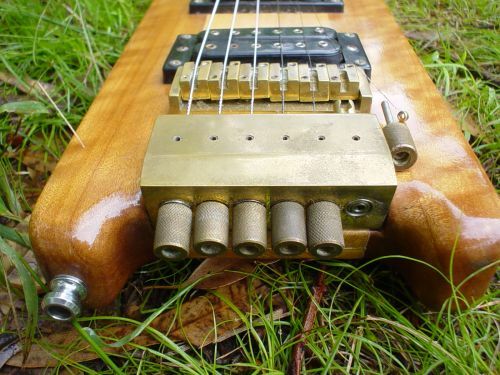 This instrument was started along with the guitar above and finished in 1993 while taking a slightly different form to tuning the headless bass. The electric is from ’87 and I used a milling machine and drill press to make the bridge and tuners. They use ball bearings but its overkill and adds too much weight but I was after the sustain. I’ve built 4 headless instruments, each time making the tuners with 35mm long M3 screws, with wood or brass head added. Then from brass stock cut blocks, hand drilled and tapped an M3 thread to get the 11mm of movement required to bring the string to pitch. This holds the ball end and a M4 allen key grub screw clamps the other. None of this requires special machines. The screws are from electrical supply shops. A thin shim of plastic does the job of ball bearing races. (Portuguese guitars have a similar system, well worth checking out). 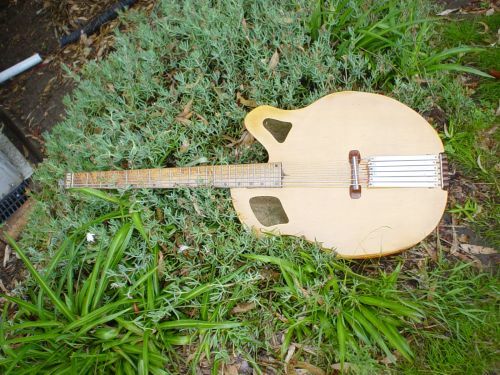 Another one of our readers, Michael Preston, shared this great link to an example of a Portuguese guitar or guitarra portuguesa that Jeff references. Thank you Michael! I suspect a few of us will now be sneaking off to the workshop in search of our own headless guitar tuner solutions. Many thanks to Jeff Turpin for sharing his work with us. Thanks Jeff! These are great. I am going to try something like your bass tuners. I’ll be back with some questions . I’m going to use Ray’s idea of the slippery wood; I have some Lignum Vitae that I have not used yet as it doesn’t take glue very well. It should be great for bolting on though. Thanks, Robert, for all of your efforts here. Amazing and inspiring. I’d like to have a go at the first principle (seahorse-headless-tuners.jpg) some day. It looks simple, precise and reliable. On acoustic-bass-end-view.jpg, I see some small brass cylinders through which the thread for tightening the string go. Are they some standard component generally available, or did you make them yourself? The small brass cylinders were cut from bar stock, drilled and tapped for M3 thread. Brass has a lubritating quality on steel. aluminum is brittle. The M3 tap is a standard tool, and used in the tuner knobs which are black palm. Thanks. Sounds like delicate work, but probably worth the effort considering the brittleness you describe. BTW, the pictures show no close ups of the head ends of the guitars, but do you also have clever solutions for fastening the strings at the end of the neck? I am about to build a headless guitar, and this is one of the issues, which I haven’t quite solved yet. If you go this route, which seems to need the ball-end, you can just get a standard locking nut. Then you’d just slip-in the ball ends, run the loose end to the nut, pull it hand tight and then lock the nut. 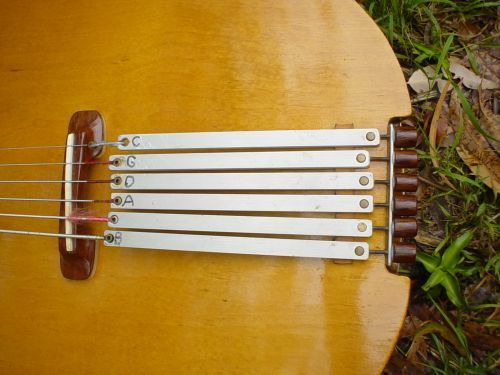 I’m leaning more towards something like Vic Chaney’s Backpack Banjo Tuners: http://www.chaneyproductions.com/images/10tuners.jpg — that way, I can use standard ferules at the headstock (further reducing the weight) and fasten the string at the tuner-end. Alex – a standard locking nut is one way as Ray suggests. Jeff sent me a picture of the head end of the guitar and he had fabricated his own locking nut. Keep an eye out for my next post though. This next guitar has a very cool method for retaining the strings. Thanks for the advice, but I need a locking nut with six screws, one for each string. It’s because I use a Schaller fine-tuning bridge, which has way less play than headless tuners. This means that I have to be able to mount each string individually with a good approximate tuning, which is impossible with most locking nuts, which has three screws grabbing two strings at a time. 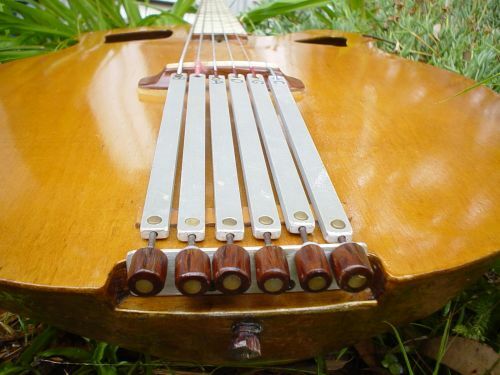 If anyone knows where to buy a locking nut for a 1 7/8″ wide nut with a screw for each string (yes, I’ll be making a quite wide neck), please let me know – though I think I’ll end up having to make it myself. BTW, I totally agree: Vic Chaney’s tuners are really interesting. portuguese guitarists make up a loop themselves at one end using pliers and a bent 1/8′ wire tool to spin the loop just like the ball end, but without the brass ferrule. It’s pretty easy and quick and you can make up your own string sets (at the exact length you want) for breaks in gigs, not that it happens on a headless design. that could open up some options at the nut end. What is the new steinberger electric like with the built in capo? i live in australia! I haven’t had any personal experience with the Steinberger Synapse models yet but I’d love to hear from folks who have. I’m especially curious since Musicyo appears to have these parts in stock which could make for an interesting custom guitar. BTW – PJ Doland used a Synapse bridge for his Klein replica. That might be a good idea, thanks. If only I can get the length precise enough. I’ll have to consider this option. 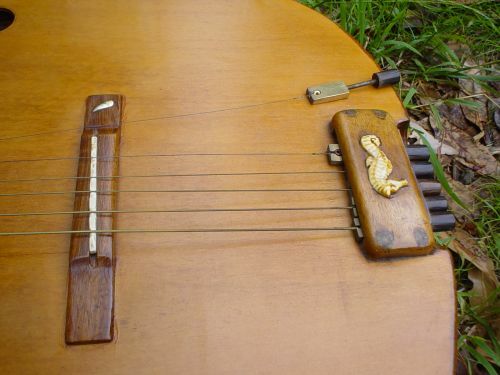 It does seem ingenious and simple at first but I found it more complex as I started thinking about how I would make something like this for a CBG (cigar box guitar). I’m not experienced in guitar making by any stretch but I do have a little building exp. The choice of headless guitar tuners over conventional tuners isn’t necessarily about simplicity – at least with regards to our site theme of guitar ergonomics. A headless guitar eliminates the headstock and moves the tuners to the body. This has the potential to improve balance, centralize mass and reduce weight. That isn’t to say that a guitar with a headstock can’t be ergonomic but its an easier equation when you’re not fighting the lever effect of tuners hanging out at the end of a neck, for example. As far as Jeff’s designs, they use conventional guitar strings which are a practical advantage since they are widely available in far greater types than double ball strings will ever be. If you look closely, you can see the ball ends go into the bridge side. Each bridge has a stop of some sort or another that the screw passes through and act’s against. The other end of the string goes into a locking nut that Jeff fashioned himself. It looks very much like a Floyd style locking nut. Detuning is no different than on a conventional headstock guitar. I can detune my headless Hohner GT2 as well as my Klein based guitar project just fine. now i know it works i’m gonna try my design for shure! Don’t forget to keep us posted! it may take a while, but i will! Mine is for a banjo, but the design would be the same for guitar. The hooks are for loop end strings but could probably be modified to work with ball ends. Oak scrap, drywall anchors, and a few hex head machine screws. Thanks for sharing your work. Very cool! Take a look at the overall guitar picture and you can make out the locking nut used to secure the other end of the string. It’s a common solution used in a number of headless guitar tuning solutions seen throughout the site. Very suprised to see no mention of the Synsonics headless locking nut and vibrato tuning bridge. Ironically, I paid $60 for the whole guitar brand new (1988), but I’d have bet just those two pieces cost more than $60 even back then. This has been a daily player with zero issues, stays in tune better than my fenders, gibson, and my parker fly. Inspired by Jeff’s tuners, I made some for my own bass using basically the same principle. They work fine. Jeff, thanks for sharing your ideas.